Home > About the Throat > What Do the Adenoids Do? The main function of the adenoids is to trap bacteria and viruses that we breathe in, either through the nose or through the mouth. The adenoids are part of the tissue that forms the immune system. Adenoids are very similar to tonsils; although the tonsils can be seen at the back of the throat, the adenoids are higher up, hanging high in the back of the nasal cavity. It is possible for a doctor to check them if he or she uses a long handled mirror, but usually, they are examined using a small endoscope that is inserted into the nose. Sometimes a baby is born with very large adenoids but usually, they, and the tonsils are small at birth. 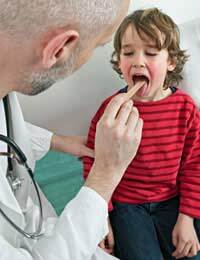 During the first few years of life children come into contact with all sorts of bacteria and viruses, and often get repeated infections, even if all do not make them ill. Children tend to have larger adenoids and tonsils; some children’s are so prominent that they cause a constantly blocked or runny nose. Gradually, the size of both the tonsils and the adenoids reduces and by the late teens and early twenties, the adenoids have shrunk to almost nothing. It is rare for adenoids to cause problems in older people if they have not had particular problems with them as a child. From childhood onwards, the function of the adenoids is taken over by the general immune system. Although adenoids enlarge during an infection to fight off the bacteria or viruses, repeated infections can result in chronically enlarged glands. When the adenoids get too big, they fill the back of the nasal passage and stop the child being able to breathe through their nose. Mouth breathing is then the only option and this leads to dry lips, a dry mouth and increases the risk of further infections. The child’s throat often feels sore, even if they don’t have an infection at the time. The blockage at the back of the nose also affects drainage of fluid from the inner ear through the Eustachian tube. This can also become blocked and can lead to a condition known as glue ear, in which the extra fluid in the inner ear builds up, causing pain and congestion. A simple operation to insert a small grommet into the eardrum can be done to provide relief until the adenoids subside.One of the main risks of enlarged adenoids is sleep apnea. Because the child is breathing through their mouth and not their nose, they can stop breathing for a few seconds at a time when they are asleep and their mouth closes. Sleep apnea can slow down a child’s growth and development and in very severe cases leads to stress on the heart, which can cause serious illness. Several years ago, in the 1960s and 1970s, having your adenoids or tonsils out was a common operation. Today we know more about the valuable role that both tissues play in immunity and tonsils and adenoids are only removed when absolutely necessary. In the case of a child with glue ear and sleep apnea brought on by chronically infected and enlarged adenoids, an adenoidectomy is usually advised as the risks of not carrying out the operation are greater than doing the surgery. Most children who have their adenoids removed recover very quickly and are able to go back to school within a week to ten days. Only in very rare cases does the operation involve complications; these are usually due to a reaction to the general anaesthetic used, or are a result of excessive bleeding when the operation has been done. Emergency treatment in both cases can solve the problem quickly. Once healing is complete, the symptoms start to disappear within a few weeks and children seem to be no less able to deal with childhood infections once their adenoids have been taken away.